Gulf Craft, recently named one of the world's top 10 superyacht builders, has made a splash with the hosting of the Sultanate's first-ever leisure marine show which opened at Almouj Marina at The Wave, Muscat. On display was some of the shipyard's largest and most popular luxury superyachts such as the Majesty 135, Majesty 121 and Majesty 105, as well as a number of new yacht models and vessels from its Oryx sport cruiser and Silvercraft leisure boat ranges. The event serves as further confirmation of Oman's growing potential as a market for luxury goods and services. The country's reputation is steadily building on the back of several high-profile resorts that have gained international clout among wealthy travelers, and growing investment in building the Sultanate's marine infrastructure and service offering. "Marine leisure assets are tipped to be one of the most natural choices for investment for wealthy Omanis, given the Sultanate's rich sea-faring heritage, natural coastal attractions and the recent investment in both marina infrastructure and waterfront tourism attractions such as luxury resorts and marine activities," said Mohammed AlShaali, Chairman of Gulf Craft. Oman has made a targeted effort at beefing up its attractiveness as a leisure marine destination – with the opening of new marinas, competitive berthing fees and investment in support facilities such as fueling stations to attract stopover yacht traffic. The overall upgrading of facilities is expected to have a positive effect in attracting more Omanis to the water, making it one of the most promising marine markets in the Middle East. Moreover, Oman was named as the fastest growing wealth market in the Middle East and Africa between 2011 and 2015 according to Datamonitor's Middle East and Africa Wealth Markets Database, which makes it a hugely attractive market for sales of luxury goods, including yachts. 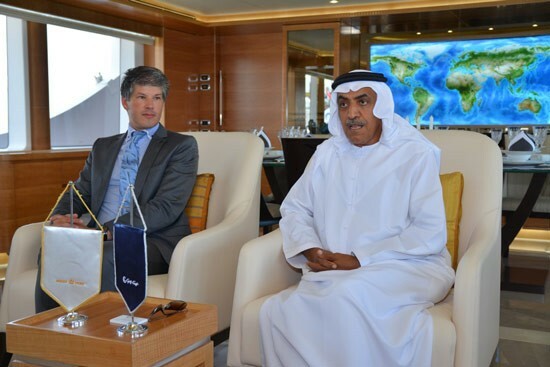 "As a leader in this market with a heritage that is rooted in the Gulf, we are keen to capitalize on the natural advantage this position affords us in Oman and to encourage more wealthy Omanis to discover and appreciate the joys of the yachting lifestyle in their home waters," said Erwin Bamps, Chief Operating Officer at Gulf Craft. Headlining the striking line-up of models that are expected to attract the attention of wealthy Omanis, is Gulf Craft's largest superyacht to be constructed to date – the Majesty 135. The luxurious superyacht delivers on the yard's long-standing reputation of providing the owner with a large sun deck, exceptional interior space utilization and impressive on-board features, like the folding balcony on the main deck seating area. Three decks of richly decorated interiors accommodate 10 guests in 5 staterooms as well as a crew capacity of 9 people. The vessel possesses an ocean-going range of 2,500 nautical miles at a cruising speed of 12 knots, running on twin MTU 16V 2,000 series engines delivering 2,600 HP each, with a maximum speed of 22 knots. The Omani premiere of the Majesty 135 is accompanied by two more market premieres; the Majesty 48, Gulf Craft's intelligently-engineered answer to the growing demand for mid-sized yachts and the Waveshuttle 56 – a brand new 'alternative yacht' design that can be utilized as a floating majlis, on-water limousine or luxury passenger transport vessel. The Majesty 48 – with its fresh, contemporary interior design, a social cockpit area and spacious fly-bridge – has been designed as a fully-option yacht that can be owner-managed and is expected to be extremely popular within the family leisure market. Commenting on the event, Hawazen Esber, CEO at the Wave, Muscat, said: "We are proud that Almouj Marina is hosting the Sultanate's first-ever leisure and marine show and that The Wave, Muscat, with its multi-dimensional venues and offerings, continues to be the destination of choice for Oman's most sought-after events centering on creating unique recreational experiences. The yachting and marine lifestyle is an integral component of our master-planned development and the show is a great fit for residents, tourists and visitors alike, with perfect brand synergy between Gulf Craft and The Wave, Muscat. We are confident that the event will be a resounding success and hope that this will be the first of many more in the future."